Were we in for a treat on Thursday, June 9, opening night of the 2011 Rockport Chamber Music Festival, and its gala 30th anniversary concert to boot. We have known about the Festival’s new home, opened one season ago, through Rockport’s deftly positioned media exposure. Be advised that the reality of the building is every bit as good as the glossies. And the “media plants” about Shalin Liu only speak to the adroit and sharp professionalism that the festival administrative staff has developed. Remember, Rockport Music started thirty years ago with the “wouldn’t it be nice” which two New Yoek innocents, soprano Lila Deis and composer David Alpher, sighed, as they viewed Rockport harbor. They found an initial supporter in Rockport local businessman Paul Sylva. At a minimum, we have here a regional jewel. Anyone in the Northeast who doesn’t make a pilgrimage to Rockport needs his head examined. We knew that Rockport has been able to garner absolutely top-flight talent for many seasons. And this year’s roster, prospectively, is a fantastic assemblage of talent. How can we characterize the playing by Ikarus? Clean, precisely articulated ornamentation, beautiful balance of tone, humor, brio, elegant expressive phrasing, teasing rubatos, beautifully planned, breathing elasticity of tempo — in short, just a high level of musicality. 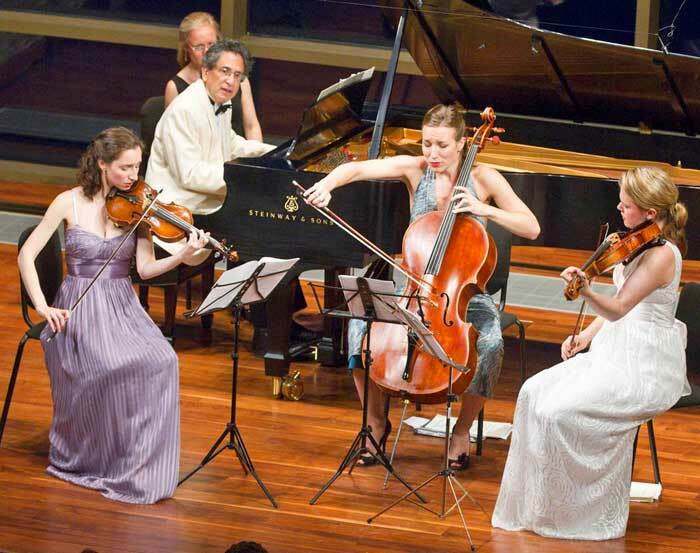 The trio’s playing remained just as distinguished in the next selection, although here even more scope was afforded for long sustained lyricism. The piece was David Alpher’s Song Without Words, a piano quartet commissioned by Rockport Music in memory of the composer’s colleague, friend, and Rockport co-founder, the Dallas-born Deis. Alpher first took the podium to make some preliminary eulogistic remarks. With fascinating detail and moving eloquence, he sketched his association with her as they nurtured the festival into prominence. Lest our readers assume that the observations about the Ikarus’s physical appearance were prompted by crass gender favoritism, let us report that the composer/pianist saw, if not raised, the trio’s sartorial chic. His smartly tailored white dinner jacket underscored a seigneur-ial demeanor that we found most engaging. Retro can be so cool. Alpher’s commemorative piece in three movements followed. Elegiac, lyrical, and unapologetically tonal, the work was touching and effectively delivered by Ikarus with the composer at the keyboard. The first movement, “Loss,” is a slow, lyrical meditation. One notable effect had us jerk our head up in pleased surprise. The composer transfers an exposed solo line from the violin to viola so seamlessly that at first it appeared to be one instrument playing the entire passage. Sometimes simple tricks can be so effective. The second movement, “Perpetual Motion,” was an up-tempo bit of boisterousness with emphatic hoedown flavor, decidedly apt to celebrate the Soprano Texan. We admired some neat and nice fughetto passages in this writing. “Perpetual Song” (the third movement) reverted to the more introspective cantabile of movement I, again appropriate to honor the memory of a beloved singer. If we must add the smallest of respectful criticism to our account of a piece which both we and the audience found pleasing, then we would say that in this movement, we hoped for the emergence of some extended, transcendent lyrical line to round out and consummate the lyricism so nicely introduced in the first movement. Also, perhaps by design, the piano was held strictly in check, so its full resources were never recruited. After intermission, cellist Andrés Díaz joined violinist Anne Akiko Meyers in the wonderful Mendelssohn Piano Trio in d minor, Op. 49. Artistic Director David Deveau excused himself from the performance because of tendonitis, and Wendy Chen substituted. She happened to be available because she was scheduled to perform the following evening, June 10. So first of all, as to Chen serving “above and beyond” as a ringer: wow, what playing. Much of this Mendelssohn contains the capriciousness of his Midsummer’s sprites. But, pianistically, the fairies have turned fiend. Chen’s playing was precise as taut steel springs and crystalline in its clarity. Expressive, rollicking through the full dynamic range of the instrument, yet sensitive to her colleagues, her performance was a “Wow!” Yes, “wow” bears repeating. The team of Chen, Meyers and Díaz delivered a tense, straight-ahead, exciting reading, with the dynamism of a locomotive. Please, this does not imply without grace and taste! Indeed, we sat in admiration of both Díaz’s and Meyers’s consummate artistry. Also, the “blend” of string sound seemed to us smoother, rounder and more balanced with the trio. For some reason, especially in those passages of the Mendelssohn first movement, where the two strings play parallel at two octaves (e.g. measures 187-195 and subsequent similar iterations) the two instruments didn’t seem to blend. We thought there might be something going on acoustically, not with the two artists’ intonation, which was fine. Meyers plays the ex-Napoleon/Molitor Strad. If Díaz was playing an equally prestigious cello, maybe we have the problem of two important personalities in the same room: talking at each other rather than to each other. And finally, constructively, I offer that the management should turn the houselights up during the setups between pieces so that the audience can consult the program notes With the lights left down, the auditorium is too dark for reading. Other than that, the evening was sweetness and delight. We cannot wait to return for another performance. Tony Schemmer is a New York-born American composer. His works are performed extensively here and abroad. Visited the Shalin Lui hall for the first time on the following evening, Friday June 10 for a concert featuring Chen, Meyers, Diaz. Truly stunning, a case where the reality exceeds expectations – the photos are wonderful but can’t convey the physicality and grace of this space. An appropriate setting for music, supporting the message that something special, spiritual, visceral and important is happening here. What a pleasure to see something done so, so RIGHT. The artistry in the Friday concert was thrilling. These artists are intense. What a pleasure to start with solo piano Chopin by Ms Chen, the piece using the full range of the beefy piano, and wonderfully presenting her artistry and unique poetry with Chopin. Later, Diaz assuredly escorted us into wild and wonderful territory with the solo cello rhapsody by Xi Wang (2006). The Tchaikovsky trio showcased all the artists, but as I was sitting a mere 3 feet from Ms Meyers, I could appreciate her intensity, imagination and musicality most vividly. Do not miss going to a Rockport Music Festival concert in this wonderful space this season!